I promised you a Valentine's Day DIY and here it is! 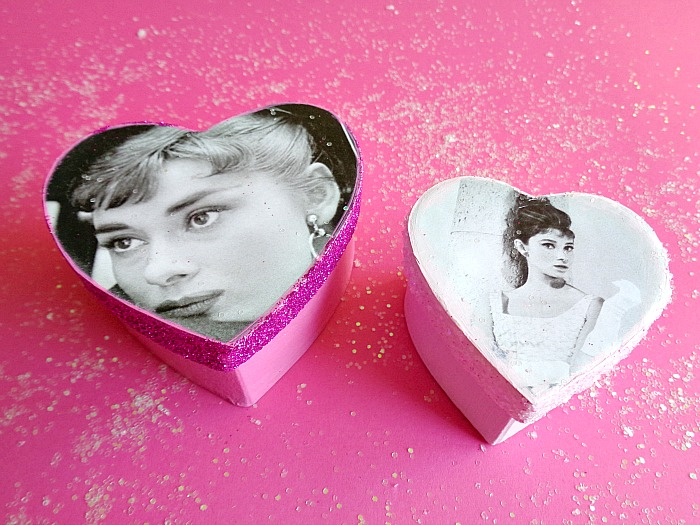 Today I'm going to be showing you how to make these super cute Calendar Paper Mache Heart Boxes! If your looking at this DIY and thinking it kind of looks similar to another DIY you've seen, then your absolutely right! I got my inspiration to make these calendar heart boxes from my 3 Step DIY: Calendar Coasters. 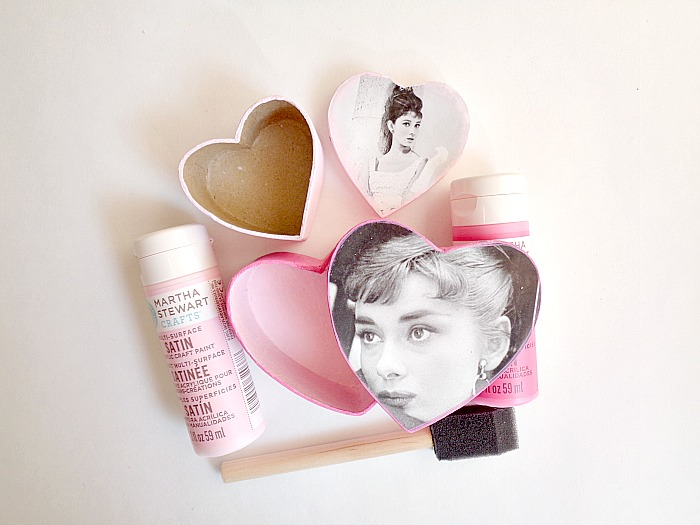 In that DIY, I talked about my love of Audrey Hepburn and my love of recycling calendars. Since you really can't get more romantic than Audrey Hepburn, I thought I could reuse some pictures from that same calendar for a Valentin's Day project. Now, you obviously don't have to use a picture of Audrey Hepburn. You could use any calendar you have on hand, old cards or even photos from Instrgram (that would be really cute)! Step 1: Tear out the pages from your calendar that you want to use. 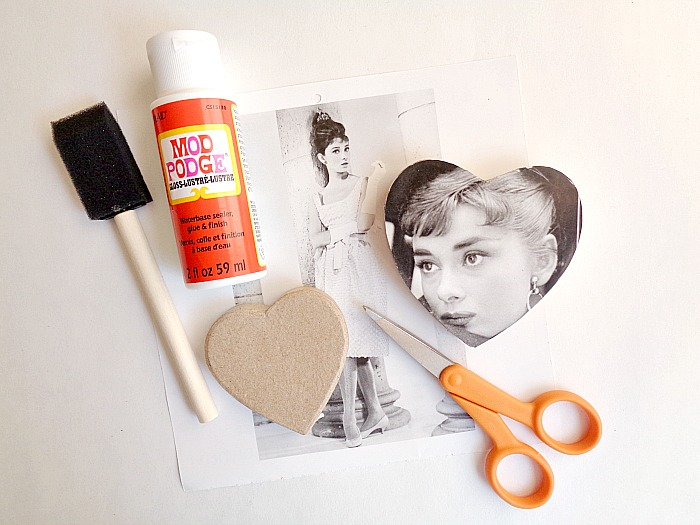 Then cut them down to the size of your heart lid and glue them into place using Mod Podge. You will want to be generous with your Mod Podge covering both the back of your calendar photo and the top of the photo to really seal it onto the heart's lid. When your calender photo is all glue down, set your heart lid aside to dry. Step 2: Paint your heart lid and box inside out. You could use one color for the entire box or two (one for the outside and one for the inside) like I did. Once you're happy with how your heart boxes look, set them aside to dry. 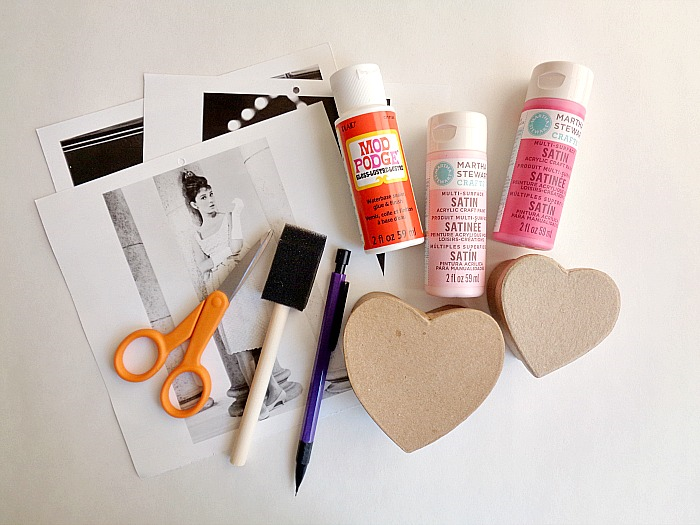 Step 3: Grab your Mod Podge and apply a layer around the lid of your heart box. Then sprinkle glitter on top to cover the Mod Podge. Once your happy with the look, set your box aside to dry. 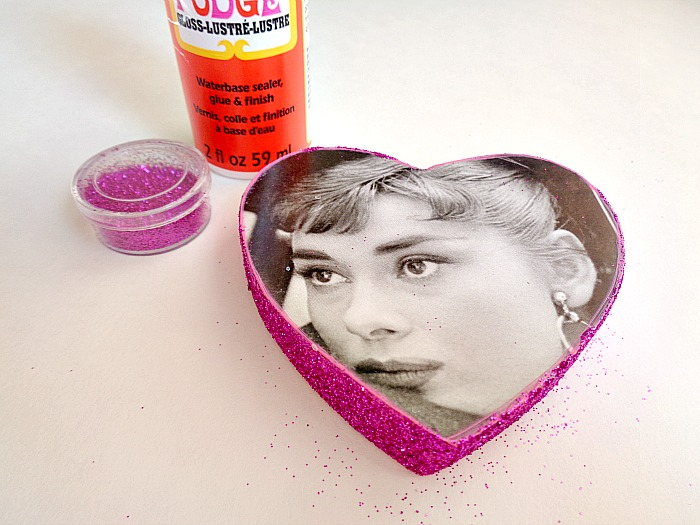 When your box is dry, go back and add another coat of Mod Podge to really seal in the glitter. When your heart boxes are completely dry, your ready to display them! 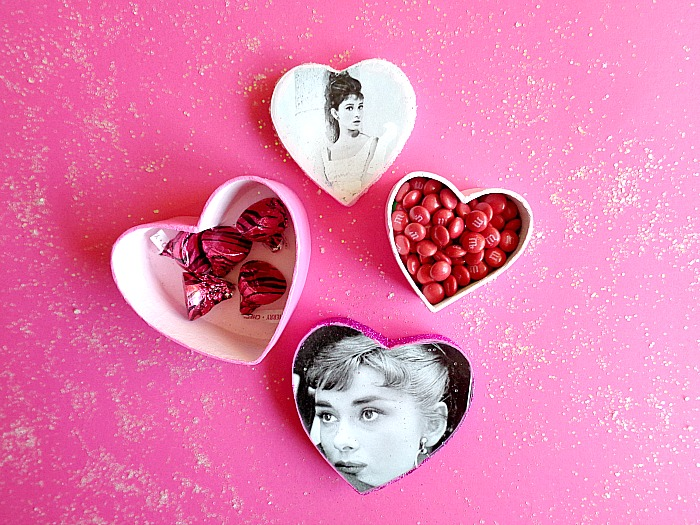 These heart boxes would make great little gifts! Just fill them up with candy and start giving them to all your friends! What are your thoughts? 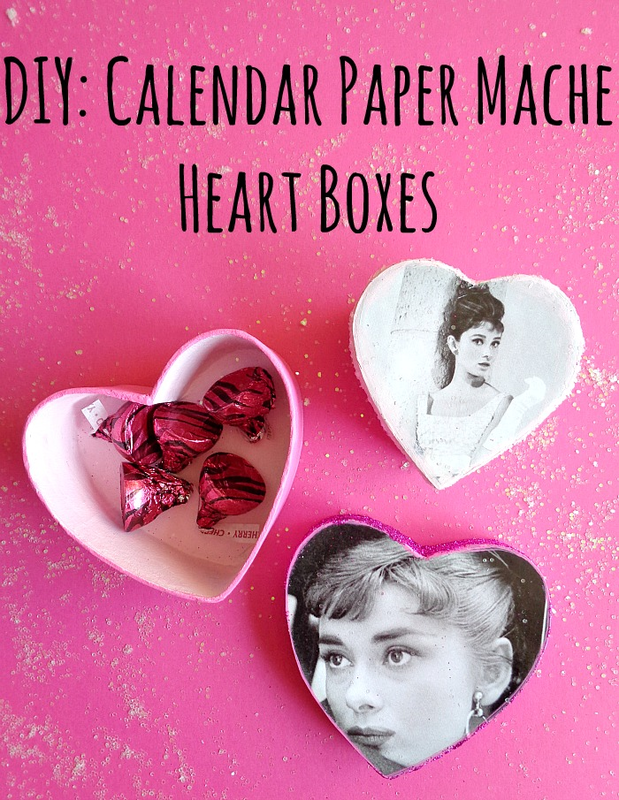 Do you like these little Calendar Heart Boxes?